You are currently browsing the Archaeofacts.com archives of Musings for the day Saturday, July 7th, 2018. Finally: cool enough today to tackle outdoor chores toward the strenuous end of the difficulty scale. By mid-afternoon, however, pretty toasty in the sun. My main morning project was planting the giant potentilla we got yesterday from the neighborhood landscaping place. I would have gotten a smaller pot if they had it, but on the other hand, when planted, this one was pretty darned fulfilling. You can see from the shadow, I was out early. This was at 8:14am. The Botanist always said dig a $5 hole for a 50¢ plant. I got maybe half-way to that ratio. Inflation? It was a deep hole, and I did Dad’s trick of setting the sod aside, and when the hole was finished, lining the bottom with it, grass side down. Makes a sponge-like reservoir. Dry as it is, that’s a good plan, although the roots aren’t really down there yet. 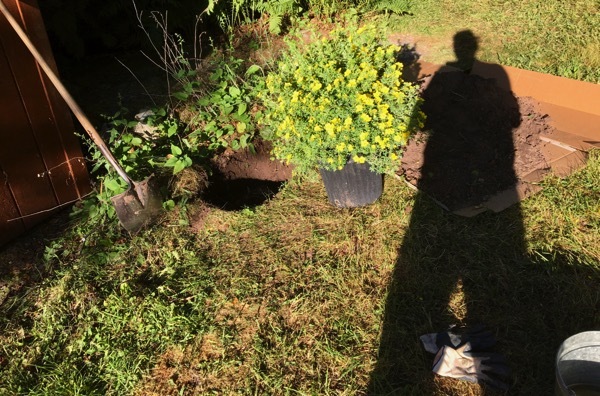 In fact, the soil was so dry that I watered the area around the hole as well as the fresh soil I dumped in the hole around the root ball. Landscapers and botanists usually call this plant potentilla, but it’s commonly called cinquefoil, with cinque meaning five, and foil referring to leaf/leaves.